Documents MLVDS FAQ: What is the difference between receiver type 1 and receiver type 2? Q: What is the difference between MLVDS receiver type-1 and MLVDS receiver type-2? Type 2 receivers are optimised for data transmission on a bus. 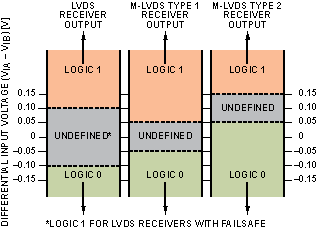 The receiver input threshold is offset to between +50mV and +150mV, so that when there is no data on the bus the receiver output state is guaranteed to be logic 0. This allows "diode-or" configuration on the bus, where teh receivers detect a logic zero on the bus when all the drivers are disabled and detect a high state when one or more of teh drivers are active.